By its very nature, driving demands an extremely high percentage of your attention (if not all of it). Yet, as you get more experienced and comfortable with driving, you might find yourself more willing to spread your attention across numerous distractions. Still, no matter how experienced you are, the more you become distracted while driving, the more your risk of getting into a car accident exponentially grows. Searching through your purse or wallet. Turning knobs in your car. Looking for items on the floor of the car. Checking and adjusting your GPS. Cognitive distractions cause your mind's focus to drift away from your driving. Thinking about something that is upsetting. Being under the influence of drugs and/or alcohol. Drowsy driving can also be considered a form of cognitive distraction, but is typically regarded as a separate problem of its own. 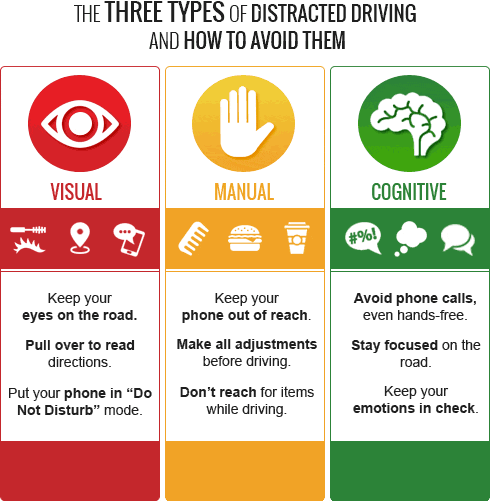 You may have noticed that some activities fall under more than one of the distracted driving categories. These activities are extra dangerous, as they tend to take more attention away from your driving than distractions that fall under only one category. Texting while driving is an especially dangerous habit, as it falls under all three types of distracted driving. Visually as you look at your phone rather than the road and cars around you. Cognitively as you concentrate on your conversation rather than the situation unfolding in your driving environment. Clearly there are several distractions that can take your attention away from driving. The good news is there are ways to avoid them. Anxiety and stress can be a big distraction. Take deep breaths and keep your focus on the road. If, for whatever reason, you can't seem to keep your focus, find a safe place to pull over and take a break. Avoid pulling over on the side of a busy street, or in dark and isolated places. Driving is not the time for arguments, which can be VERY distracting. Save the fight for when you are in a safer setting. When possible, put your passenger in charge of tasks like temperature control or changing the music. This is especially important when you are driving a new car, or a car you are not used to driving. Get to know the car's controls BEFORE you start driving. This will help minimize distractions in cases where you must use one of the car's controls. Most car stereos allow you to preset stations so that you only have to press one button to hear what you want. Cell phone use, whether for texting or talking, is a huge distraction. Put your phone away, and do not let yourself use it until you are out of your car. There are even some smartphone apps that will help keep you from driving distracted. If you are going for a long trip, make sure you have had plenty of rest, food, and drink. Remember to factor meal times into your schedule so that you don't feel pressured into eating while driving to make it to your destination on time. Set up your GPS before you start driving. In the fast-paced, multitasking world that we all live in, driving distraction-free can be difficult—but it is possible! Take the pledge against distracted driving today, and begin to live and drive in a safer world. To learn more and test your knowledge of distracted driving, quiz yourself here.